DIY or Do-It-Yourself has been trending over the past few years as a way to be creative and save money. Many go online to find ideas and step-by-step instructions for their next projects. These tutorials are partly available because of innovators who seized the opportunity to get in on DIY before it became trendy and shared their skills online. 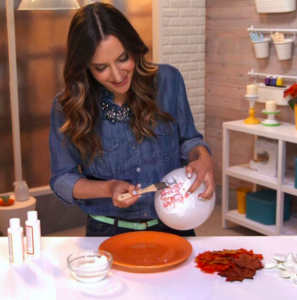 This is exactly what Blogger Brit Morin did to build her DIY empire. Morin built her following by blending her social media skills and passion for crafts. She created her own website filled with thousand of project ideas for every occasion like holidays, weddings, girl’s nights, gardening and dinner parties-just to name a few. Now, Morin is even an author of her own book and a DIY and lifestyle contributor for NBC’s Today show. For more on fun project ideas, watch our full interview with Brit Morin below. Or tune into this week’s episode of California Life with Heather Dawson airing nationwide!